Both men and women around the world desire to have flawless skin. They are willing to do anything that can help them get flawless skin at home. From applying basic home remedies to trying beauty and cosmetic products, they try most of the things coming their way. But applying cosmetics are just temporary solution that may harm at times. Using natural ingredients for skin treatments is gaining ground rapidly, since the people are becoming aware about the side effects of using synthetic chemical cosmetic products. Not only using the right products but also eating right is incredibly important, if you want a flawless skin. Once you start eating right, you will notice a significant improvement in the overall quality of your skin. And if you are wondering about how to get flawless skin at home then here’s the post worth checking for today I am going to discuss about 9 skin friendly foods that’ll help you get flawless skin at home. When you eat veggies and meat in the right quantity regularly, the nutrients in them are absorbed well by your body, and are metabolized effectively to give you their full benefit. The antioxidants present in vegetables, eliminate free radicals from your body, and reduce oxidative stress. Once oxidative damage is minimized, your skin becomes smoother and regains its lost glow. Flushing out the toxins and wastes also makes wrinkles disappear and restores skin elasticity. So what we eat can seriously impact the quality of our skin. And if you strive to get flawless skin at home, then you ought to eat skin friendly foods. As you remove the saturated fats, carbs and excess calories from your diet, your internal health gets boosted, as a result of which, your exterior look improves. Skin is your largest sense organ, which acts as an exterior flexible armor keeping away the harmful UV rays, microbes and chemicals from more sensitive inner tissues. Pimples, acne, dark spots and clogged pores are common phenomena, especially for teens who recently hit puberty. Partly hormonal changes are responsible but pollution and consumption of junk oily foods are also some of the reasons for such skin blemishes. But if you are serious about getting flawless skin at home then you have to mindful about what to eat and what to avoid. 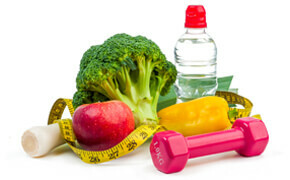 You should eat skin friendly foods and avoid eating oily, junk and packaged foods. If you are unsure about such skin friendly foods, then that’s what we are going to discuss below, so read on. Here are the top 9 skin friendly foods that you should include in your diet to get flawless skin easily at home. Oysters are number one source of Zinc and Magnesium. One cup of mollusk raw oyster (248gms) contains 225mg of Zinc, which is 1502% of our daily requirement of it. Zinc has been found to be most effective against acne. In a study, 54 acne patients were fed either a daily zinc supplement or a placebo. At the end of six weeks, the average amount of acne in the group provided with zinc had fallen by 33%. Zinc has been known to bring down chronic inflammation by improving the efficiency of your immune system. Zinc keeps inflammation in check, therefore preventing immune attacks on bacteria like p.acnes from becoming needlessly powerful. According to this study, zinc can bring down levels of NF-KappaB, an inflammatory switch that controls the secretion of several pro-inflammatory chemicals behind acne. Zinc also acts as an antioxidant removing the free radicals and protecting skin’s lipids and fibroblasts – the cells that produce collagen, the support structure of your skin, when it is exposed to skin-damaging pollutants and UV rays. 248gms of raw oyster contains 117mg of Magnesium, which is 29% of our daily requirement of magnesium. Magnesium is indirectly connected to the onset of acne and pimples. Magnesium is required for synthesis of neurotransmitter melatonin that is vital for adequate sleep. And lack of sleep is one of the major causes of acne. So if you are looking for the best skin friendly foods, then oyster has to be in your list. Spinach provides your body with almost the same amount of protein as meat does. Cooked spinach is indeed good for health but so is spinach juice. Spinach is rich in Vitamin B complex that prevents tanning and protects your skin from the harmful sun rays. The Folate and Vitamin K helps you attain clearer skin by reducing acnes, itchy skin, dark patches and other skin blemishes. Moreover, spinach also contains Vitamin C and Vitamin A. Vitamin A helps you enhance your skin complexion whereas Vitamin C ensures your skin cells grow and develop at a healthy rate. The anti-oxidants in spinach keep away signs of ageing like wrinkles, fine lines and so on. Once the free radicals have been dealt with, your skin appears rejuvenated and more radiant. One bunch of spinach (340gms) contains 9.2gms of Iron, which is 51% of our daily requirement of the mineral. Iron plays a vital role in transporting oxygen to all the cells of our body. That is why deficiency of iron makes our skin look pale. Since our body is not very efficient in absorbing iron from spinach, add Vitamin C to it like, lemon juice, to speed up the absorption process. The remarkable amount of water present in spinach is helpful in keeping our skin hydrated and prevents it from getting flaky and dry. The Vitamin K in spinach strengthens the walls of blood vessels, boosts proper blood circulation, reduces skin inflammation and reduces the dark circles under the eyes. So spinach has to be in your list of best skin friendly foods and you can cook it or make spinach juice and consume it. Almond oil is one of the most commonly used cosmetic oil used as a moisturizer and as make-up remover, mainly because it leaves no greasy residue behind. The plant phenols and omega-3 fatty acids in almonds boost your immune system, maintain muscle mass, reduce elevated levels of blood pressure, lower body fat and enhance the energy level of the body. One cup of grounded almonds (95 gms) contains 255 mg of Magnesium, which is 64% of our daily requirement of the nutrient. Magnesium is known to counter the reaction of stress hormones, which can speed up your aging process and aggravate acne. 95 gms of grounded almonds also contain 251 mg of Calcium, which is 25% of our daily requirement of it. Calcium is beneficial in absorbing nutrients properly and 20.2grams of Protein, which is the building block of skin. According to studies, the alpha-tocopherols (Vitamin R) and polyphenols in almonds possess photoprotective effects. These nuts could help you ward off inflammation, oxidative stress, reddening of skin (erythema) caused by UV radiation exposure. The major category of flavonoids found in chocolate is flavonols. Flavonols lowers the blood pressure and improves blood circulation. Cocoa significantly reduces the plasma levels of oxidized LDL plasma levels. It reduces the level of LDL-cholesterol or “bad cholesterol” and increases HDL-cholesterol or “good cholesterol” in the body. Since LDL cholesterols has a role to play in development of atherosclerosis, chocolate helps prevent this heart disease by reducing the level of LDL cholesterol. Dark chocolate directly acts on neurotransmitters and help boost the hormones to uplift your mood. The flavonoids in chocolate help prevent mood-swings and reduces the level of stress-hormones in the blood stream. According to a research by Swiss scientists, people that suffer from anxiety disorders, when ate an ounce and half of chocolate every day, experienced reduced level of stress-hormone and diminished metabolic effect of stress on the body. Cocoa is a super skin friendly food, which is rich in antioxidants. Antioxidants help protect the skin and have anti-ageing properties. It decreases the onset of wrinkles and skin dryness. Strong anti-oxidants like flavonoids help lower the effect of oxidative damage caused by stress, pollution or UV rays. Anti-oxidants have also been known to prevent macular degeneration and reducing age-related eye disorders or blindness. According to this study, the flavonoids found in fresh and pure cocoa beans confers significant photoprotection and can thus be effective at protecting human skin from harmful UV effects. So include dark chocolate in your skin friendly foods list and have them whenever you feel like to enjoy the taste and get flawless skin. One cup of chopped red pepper (149 gms) contains 190 mg of Vitamin C, which is 317% of our daily requirement of the vitamin. Antioxidant Vitamin C fights off the free radicals and protects our skin from oxidative damage. Oxidative stress leads to premature aging, fine lines and wrinkles. Vitamin C is also needed for the production of collagen, which keeps our skin soft, supple, firm and prevents skin damage. The capsaicin in red peppers is known to reverse the signs of premature ageing. The anti-oxidants and capsaicin together eliminates uneven skin tone, fine lines and wrinkles. Regular consumption of red bell pepper will keep away skin problems like acne, pimples, skin rashes, and skin blemishes. The antioxidants in red peppers are sure to protect your skin from ultraviolet rays of the sun. Silicon found in the carotenoids of bell peppers is beneficial for lowering inflammation due to arthritis. So all in all, red peppers should must be in the list of your skin friendly foods to flawless skin. According to studies, cucumber significantly reduces the sebum production of your skin. Excess sebum along with dead skin cells clogs skin follicles, eventually leading to acne. Cucumber decreases unneeded skin moisture, which further strengthens the anti-acne effect of cucumbers. Cucumbers are easily available across the year and hence you should count it as one of the best skin friendly foods for flawless skin. Cucumbers have high water content and eating cucumber can be seriously beneficial for your health, especially for your skin. About 52 grams of sliced cucumbers contain 49.5grams of water. Thus, they are able to maintain the correct moisture level of the skin and keep the skin hydrated. The juice of cucumbers has powerful anti-hyaluronidase property, which means cucumbers keep the enzyme hyaluronidase from degrading into hyaluronic acid that draws moisture from the skin. Cucumbers cease the breakdown of protein elastin, which maintains the elasticity of the skin by enzyme elastase. This makes your skin tighter and firm and encourage cell renewal and collagen production. Several sun-protection creams and lotions have cucumber as their star ingredient. The antioxidant property of cucumbers due to the presence of Vitamin C, tannins and flavonoids fights off harmful free radicals that causes cell damage. Cucumbers also have pain-relieving property, thus providing relief from sunburn. Cucumbers reduce the melanin content of skin and acts as a natural sun tan remover. Cucumbers obstruct tyrosinase, an enzyme responsible for producing melanin, hence inhibiting melanin synthesis. The anti-oxidants in cucumbers, especially Vitamin C, is useful when it comes to skin whitening. The dark circles and dark patches are greatly minimized and finally removed on regular consumption of cucumbers. Yogurt has been known used to beautify skin since ancient eras. It is a superb natural ingredient to clear away pimples and acne. Yogurt is a powerhouse of nutrients that are remarkably beneficial for obtaining a flawless skin. Yogurt contains Zinc, which has anti-inflammatory properties that are useful when treating the redness and swelling of acne or rashes. Zinc is a mild astringent, which means it helps tighten tissues and is a vital nutrient for tissue growth and cell production. It not only diminishes acne and pimples but also stabilize sebum secretion from sebaceous glands, thus averting oily skin and acne breakouts. The lactic acid in yogurt moisturizes and exfoliates dry skin. Besides arresting onset of wrinkles, lactic acid removes the already existing ones. Yogurt also contains calcium that prevents skin from becoming dry and heals dry skin. Calcium also enhances skin renewal. The B-Vitamins in yogurt like Vitamin B2, B12 and B5, keep your skin hydrated and glowing. Riboflavin or Vitamin B2 is utmost important for cell growth and regeneration. It protects skin from oxidative stress of the harmful free radicals. Vitamin B5 facilitates production of healthy fats in cells. A 198 gms of salmon fillet contains 3996 mg of Omega-3 fatty acids. Because of its unprecedented levels of omega-3 fatty acids, salmon is beneficial for achieving a glowing, flawless skin. The carotenoid antioxidants of astaxanthin present in salmon minimizes free radical damage. A world-renowned dermatologist Dr. Perricone, MD, suggests eating salmon thrice a week for radiant skin. The omega-3 fatty acids control inflammation, which leads to negligible breakdown of collagen and elastin, thus making your skin look firm and youthful. Salmon contains healthy fats that feed the oil glands of the skin, which in turn keeps skin hydrated and soft. The Vitamin D found in salmon has photoprotective effect, which means, it can protect your skin from the negative effects of the UV rays of the sun. Additionally, Vitamin D is also essential for cell repair and cell growth. One cup cherry red tomatoes (149 gms) contains, 18.9mg of Vitamin C, which is 32% of our daily requirement of it, 1241 IU if Vitamin A, which is 25% of our daily requirement of it and 11.8mcg of Vitamin K, which is 15% of our daily requirement of it. All three of these vitamins are highly beneficial for a glowing and radiant skin. Tomatoes contain a phytochemical called lycopene, which is a strong anti-oxidant that flushes out the harmful free radicals from our body. Lycopene is also found in carrots and watermelons but the highest quantity of it is found in tomatoes. The red carotene lycopene protects our skin from UV rays and makes it smoother and softer. Tomatoes enhance procollagen level in the skin to a remarkable percent, which reverses skin ageing. They are rich in Vitamin C that cools, whitens and firms skin. Vitamin C is a natural astringent that helps balance the proper pH level of the skin and hence prevent breakout of acnes, pimples and other skin blemishes. The skin of the tomatoes contain two flavonoids – quercetin and kaempferol, both of which have the capability to counter inflammation. This anti-inflammatory effect of tomatoes further pushes away the onset of acne and pimples. Tomatoes also possess Lutein, which has been found to boost skin health and provide protection against skin cancer. What we eat directly impact our skin, hair and health. When we eat right, we become healthy and when we eat wrong, we fall sick. If you want to improve the quality of your skin and overall health, then you should eat healthy skin friendly foods. 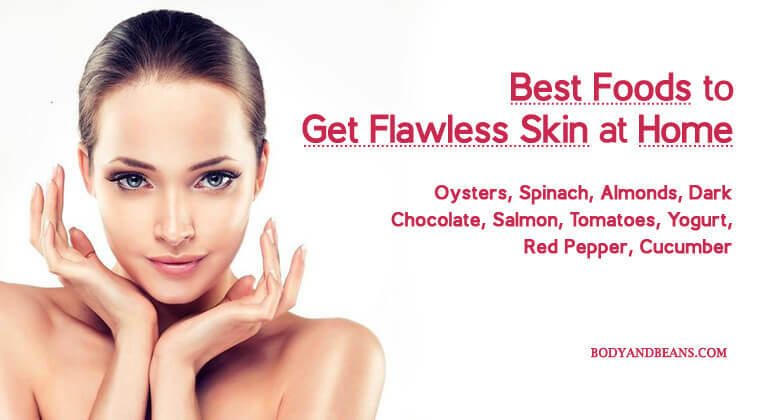 Skin friendly foods like oysters, spinach, almonds, dark chocolate, salmon, tomatoes, yogurt, red pepper and cucumber are exceptionally beneficial when it comes to achieving flawless skin at home. All of these foods have high level of anti-oxidants that remove free radicals and reduce oxidative stress. Once these harmful free radicals are removed, your skin tone will improve and become flawless. The more elastic the skin will be, the more wrinkle free and youthful it will look. The nutrients in these foods make sure your skin gets the healthy dose of vitamin and minerals it needs to achieve and maintain its natural radiance. If you eat these skin friendly foods in right proportion, you will definitely be able to improve the quality of your skin. When choosing tomatoes, peppers, cucumbers or spinach, make sure, you buy the organic varieties eliminating the possibility of synthetic pesticides and insecticides that are sprayed on the inorganic crop. When choosing you salmon, go for the wild Atlantic variety because farmed varieties are not that good for health. Choose wisely and you will be rewarded! Overconsumption of some of these might lead to unwanted side effects. When consuming dark chocolate, check to see if the added sugar is at a minimum. You do not want to gain calories in the name of getting flawless skin. Moderate the consumption of red peppers since too much capsaicin can upset your stomach. Aside from nut allergy, too much almonds can increase the level of Vitamin E in your body, which causes dizziness and lethargy. Norovirus in oysters causes stomach cramps, vomiting and nausea. Did you try any of these items recently? If not, try any of these or a combination of these right away and experience their benefits first hand. Until then, stay healthy and gorgeous! For me, taking care of skin is the most important step. Thanks for sharing your words with us.